If you’re like many investors, you may have practiced the adage of “sell in May, and then go away.” But it’s September now and the institutional investors are moving back into the market. And that means that the recent highs in the market, propelled by stellar earnings reports, are firmly in the crosshairs. These investors are going to be looking at stocks that are overvalued, and there a number of stocks that appear to be prime contenders, including some in the blue-chip category – stocks of the companies with the largest market caps. But there has to be a reason to sell beyond a high stock price. It's always important for investors to understand the "why" beyond the "what". 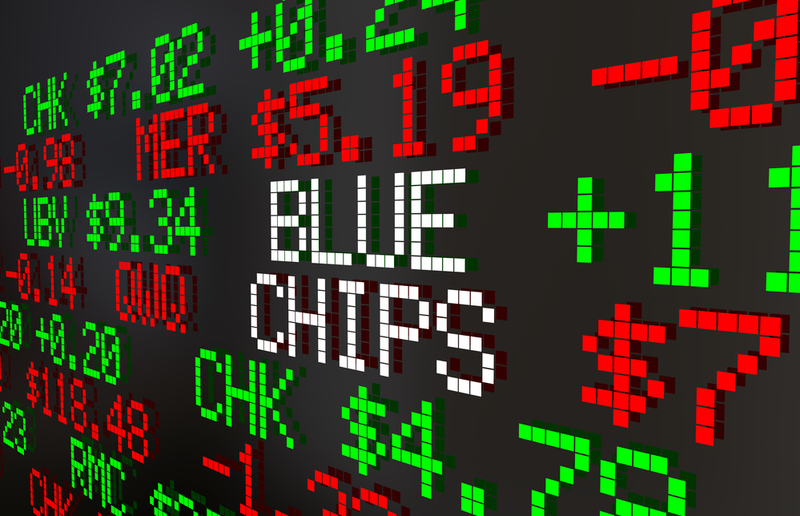 So as you review this list of seven blue-chip stocks that you should consider selling now, we've identified the why to help you make an informed decision. IBM is attempting to reinvent itself by shifting to what the company is calling their “Strategic Imperatives” group. This is expected to allow the company to take advantage of the rapidly growing trend towards security services as a global corporate priority. A recent Goldman Sachs survey of chief information officers forecast that 45% were anticipating spending more on security-related services in the next 12 months. At first glance, their pivot appears to be working. In their most recent earnings statement, Big Blue reported that security revenue was up 79% a year ago and now tops $1 billion. Analysts, however, have some concerns. For starters, IBM does not separate security revenue as a separate entity from their other business segments. In the second quarter that meant that much of their growth in Strategic Imperatives revenue was driven by their mainframe and Unix hardware. And even though IBM’s security business reported $3.4 billion growth in year-over-year revenue, it is a small fraction of the company’s total revenue that tops $19 billion. It’s never easy to turn a battleship, and the odds of IBM being able to do this look iffy. IBM is currently trading at around $145 per share, down from its 52-week high of $171.13. This could easily be titled “With friends like these … “. Whirlpool Corporation was one of the original beneficiaries of the Trump administration’s tariffs on Korean-made washers and dryers. For many years, the company had been accusing Korean manufacturers Samsung and LG of “dumping”, that is, flooding the United States with less expensive washers and dryers. Whirlpool found a friendly ear in the Trump administration who put the tariffs into effect. However, any boost they received was short lived. In the aftermath of the administration’s tariffs on steel and aluminum, Whirlpool is feeling the repercussions in higher material costs as consumers still desire stainless steel appliances. In its most recent earnings statement, Whirlpool cited “input costs” would be between $50-100 million above their forecasts, an announcement which has greased the slide of its stock, which is down 18 percent year-to-date. While the company may realize some benefit from the increased price of washers and dryers (up 17%) most of which has come at the expense of competitive models from overseas, it remains to be seen if Whirlpool can gain enough traction to offset their rising material costs. WPL is currently trading at around $125 per share, down from its 52-week high of $190.73. To call Boeing a hot stock would be an understatement. The airplane manufacturer has problems on two fronts. First, it has a valuation problem. Since the beginning of 2017, the manufacturer has seen its stock move from $140 per share to an eye-popping $350 per share. Who do they think they are, a high-flying tech stock? And that’s the problem. Boeing is currently selling at around 22x earnings while offering a dividend yield of 2%. By itself, that wouldn’t be too bad. However, historically Boeing has sold for under 20x earnings and paid out a dividend in excess of 3%. The other problem is that they may be in danger of lower earnings. Boeing is not the only airline manufacturer ordering new planes. However, we’ve seen this movie before and it doesn’t end well for airline stocks. Typically airlines have a difficult time keeping their expansion in line with higher profits. This puts pressure on margins, which in turn drives down demand for new planes. And of course, the industry is always sensitive to fluctuations in oil prices which extend to jet fuel. And if the stock needed any more headwinds, they face uncertainty surrounding the upcoming mid-term elections. If the Trump administration loses control of Congress, it would likely mean a reduction in defense-related projects. Investors have been rewarding Nvidia for several years. The stock has increased from $20 per share to nearly $280 per share. The growth wasn’t by accident. The company is a leader in artificial intelligence computing and was been well-positioned as the gaming and crypto markets were expanding along with the need for the graphics cards and components made by Nvidia. However, the pressure is on. With a stock that is now valued at 41x earnings but is projecting its earnings per share (EPS) to grow at less than 20% a year. This means two things. First, they are currently looking overvalued and second, if they have any misses in their earnings report, their stock could take a hit. So how possible is that? There are two potential issues. The first is in the autonomous car market. The nascent industry has the potential to make Nvidia a big winner. But it also falls into the category of “what could possibly go wrong”? And the answer is, with so much unknown, quite a bit could go wrong. The second issue revolves with data centers. The company’s graphic processing units (GPUs) have become popular as a source of processing power for servers. But Nvidia isn’t the only player in this market, and investors have been pouring money into their major competitor, AMD. There’s probably only room for one of these companies to take the market share that would lead to big profits and if Nvidia comes in second, it could be a hit to their market cap. Pepsi is a leader in a category that faces significant challenges. So let’s start with the good news. Since its stock fell nearly 20% to reach a low of $97 in the spring, it has bounced back and now sits around $112. Unfortunately for investors, that may be as good as it gets. This is a sector that is in the crosshairs. From an investing perspective, when interest rates rise, investors move away from dividend-heavy stocks, which is a signature feature of food and beverage giants such as Pepsi and Coca-Cola. True to form, over the last 12 months, this sector has seen investor money flee, but Pepsi has outperformed. Do they know something others don’t or is this the case of being the tallest of the seven dwarfs? Soda sales continue to decline as consumers seek out alternatives such as energy drinks and soda, in general, has become one of the poster children for childhood obesity, striking at a core demographic. The larger problem Pepsi may have is more fundamental. Their stock is currently trading at 20x earnings which is significantly higher than many of their competitors who are trading at 15x earnings. A spread like that signals that investors may be ready to take profits and cut Pepsi down to size. McDonald's is a company that continues the process of re-inventing itself but not really. And that's the good news. The company has figured out that there are some customers they may not be able to reach. These customers have grown up with more fast-casual options that make McDonald's seem less of the Mac Daddy it was a generation ago. With that said, it's important to note that their move to upgrade the décor of their stores and customer service options (including pre-ordering and home delivery in some markets) may be confusing to investors. Automation is nice and certainly features like ordering through a mobile app or in-restaurant kiosks may improve the customer experience, but they aren't going to necessarily reduce the companies need to have actual employees preparing the food. Second, the fact that a lot of competitors to McDonald's are going through tough times isn't really going to improve McDonald's sales. As we said, the company has their customers and just because a competitive franchise shuts its doors doesn't mean those customers will seek McDonald's as an option. To be sure Burger King remains their largest competitor. What may concern investors more is that the company has reported 16 straight quarters of decreasing top-line growth, including a drop of 12% in the last quarter. The stock has been taking a hit lately but has rebounded to around $163 per share. That’s down from a high of $178.70 in February. Retail, in the form of brick and mortar stores, may not be dead. Like newspapers, malls may never completely die. But make no mistake, they’re still struggling. The problem isn’t just Amazon. It’s the idea that malls used to be a form of entertainment and, let’s face it, consumers have a lot more entertainment options today, and that means that a lot of retailers are still fleeing the overhead-intensive mall model. Which is a key reason Simon Property Group has a problem. Although their stock is sitting around $180, it still is surrounded, literally, by retailers such as Sears and JCPenney that are clearly failing. With all this said, it’s hard to justify a stock that is trading at 15x earnings. The company also offers a somewhat attractive dividend yield of 4.4%, but in a climate of rising interest rates, that will probably not be enough to impress investors. Ratings Breakdown: 8 Buy Ratings, 6 Hold Ratings, 0 Sell Ratings. Anytime an investor sees stocks getting a bit frothy, it's a good time to evaluate, and perhaps rebalance their portfolio. Many of the stocks in this report are on the rebound after falling from recent highs. However, as the analysis shows, they all face issues that could put downward pressure on the stock in the short term or they may have issues that threaten the stock from a big picture perspective. Investors hate uncertainty and with a general election coming up this Fall, there are many reasons why the big money in the market may be looking to take some profit. Now would be a good time to take some profit from these blue-chip stocks and shift money to some of their more conservative siblings.